Each month, different members of the organization are interviewed for the monthly e-newsletter. Interview notes are transformed into short articles that highlight the unique qualities and features of the members and their businesses, respectively. 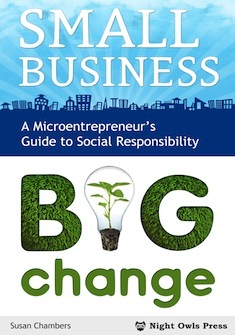 "Greening Your Microbusiness' Environmental Footprint When You're on a Micro-budget." Guest post for Greening Vancouver, August 2013. This post offers a few guidelines for microbusiness owners who would like to green their business without going broke or getting stuck in "indecision paralysis" because they don't know where to start. their S-R (social responsibility) readiness, identifying and setting affordable and achievable S-R goals, and creating an easy system for tracking their successes. Learn more about the book and download a free sample chapter here. ideas and issues related to these themes and provides readers with small, manageable actions that contribute to big changes. This post identifies and provides solutions to seven often-made survey question design errors that result in bad (unusable) data and wasted time. Wrote concise statements summarizing each of the 60+ major intentions identified in the third edition of the Action Guide; edited the second edition of the Action Guide.